In part 1 of this article, I put forward the theory that we connect more emotionally with characters from portrayed on TV in the confines of our lounge room, than we do with cinematic portrayals of legal heroes. It was Patrick Duffy, forever famous for portraying Bobby Ewing in the 80s drama Dallas, who believed that one reason we have an emotional connection with TV characters is because the audience watches them between their feet. I also have a theory that, for some people, our TV is a subconscious extension of our notion of our values and our ideal world, all contained within the parameters of a 24-inch flat screen. Why do I say this? Over the past few years there’s been a cyberspace debate which I think promotes a distasteful, offensive and racially tinged line of thought about the direction of a sort-of-legal mystery drama, the enduring British TV series Midsomer Murders. I became a fan of Midsomer Murders only a few years ago and I guess for many devotees it’s our Sunday roast comfort meal, which we savour in our lounge, knowingly disconnected from reality for two hours as DCI Barnaby and his loyal sidekick Sergeant Charlie Nelson solve their way through a string of murders. And all done in a quaint, charming and typically English village in the fictional county of Midsomer. I love Midsomer Murders (and I’ll probably earn the ire of die-hard fans who lament the departure of the original DCI, Tom Barnaby) and of course all fans know the premise of Midsomer Murders is absurd: the body count in these picturesque English villages would notoriously rank Midsomer County as one of the most dangerous places on earth (well in the UK anyway). But we accept that a relatively high number of Midsomer folk have murderous tendencies, and for a TV show there’s nothing wrong with that. It’s TV after all. But strangely some of the Midsomer fans who without question suspend their disbelief at the unrealistically high body count, are willing to display major disbelief bordering on severe apoplexy at the sight of a “minority” (code for anyone who doesn’t resemble anyone of white European stock if you know what I mean) in a Midsomer village. We can debate the census statistics of the real life racial profile of a British village, although having lived in the UK for a few years I can attest there really are minorities living in UK rural and remote areas. But so what if a true life British village is void of minorities? Last time I heard, there’s a difference between a TV drama and a documentary, and Midsomer Murders ain’t no documentary and surely no-one expects a TV drama to be 100% true to life. After much thought, I think these fans’ concerns about “political correctness running amok in Midsomer” possibly harbours a more deeper and sinister agenda. Sadly I believe, it’s a deep affront to their sensitivities that people-who-don’t-look-like-them (if you know what I mean) are in effect intruders in their house, their lounge room, their sanctuary, a harbour from the real world. These minorities suddenly appear between the feet of Midsomer loyalists who wish to take an evening’s leave from the reality of the world to relax on their couch without feeling uncomfortable by the appearance of minorities who in real life would never been seen inside their house. Why isn’t the Australian Consumer Law protecting the loyalists from such intruders on their 24 inch flat screen? For such Midsomer loyalists, real life alone is gritty enough although they are willing to cope with watching minorities between their feet if they’re being pursued by unbearable evening “current affairs” reporters, being depicted serving cocktails to drunk tourists in Bali, or if they’ve accidentally switched to SBS after watching The Footy Show. There we have it for better or worse. Television for some becomes an escape from the harsh realities of life. Nothing wrong with that until viewers subconsciously at least appropriate (or misappropriate) a TV storyline to shape and perpetuate stereotypes (mostly negative) out in the real world. To their credit high-rating US legal dramas like L.A. Law, Ally McBeal and The Practice featured minority performers in lead roles. Whilst I’m no psychologist, I wouldn’t be surprised if the presence of minority characters in living rooms across the USA helps to remove subconscious barriers to the acceptance and promotion of minority lawyers in real life (if that sounds incredulous, there is a body of thought that Dennis Haybert’s positive portrayal of an African-American President in the TV series 24 paved the way for the election of Barack Obama to the White House just a few years later). TV can open up hearts and minds to accepting new situations outside their norm. Just recently The People v. O.J. Simpson screened in Australia, based on the O.J. Simpson trial back in the 90s. Pop culture theorists can make the case that the O.J. Simpson trial was the biggest reality TV show of all time, even bigger than the Kardashians (coincidentally Robert Kardashian, the father of the Kardashian reality stars, was a close confidant of O.J. Simpson) because it was one of the first criminal trials to be broadcast in the USA. Americans were introduced in their lounge room to the dignified presence of Judge Lance Ito, a Japanese-American jurist presiding over the biggest trial of the century (well according to the media, but still). Yes, Australia has some fine legal TV dramas over the years … Carson’s Law in the 80s, Janus a decade later, and more recently Crownies, Janet King and Rake (despite its title, the SBS series The Family Law, which features an all Asian cast, is not a legal drama). I stand to be corrected, but it’s rare to see a minority performer featured in a support role let alone in the main cast of an Australian TV legal drama. Maybe with a touch of fortune the casting directors will be open-minded and cast a minority paralegal who in the storyline is grateful to the law firm to be appointed on a five year contract, coincidentally the length of a TV series run. Or if the producers are bold, open minded and ground breaking they could grant an Asian actor the prize role of the law firm’s crack IT director of course – yes I’m being sardonic and sarcastic all at once. It’s timely though that the Australian Racial Discrimination Commissioner Tim Soutphommasane warned that young lawyers of Asian backgrounds are held back from promotion up a firm’s ladder due to stereotypes of them as “technicians, not leaders”. Lawyers are intelligent folk who are supposed to act rationally on the facts, but I can’t help but wonder how influential TV has been in giving both aspiring and practising lawyers the impression that minorities are pretty much invisible in the forefront of legal practice. Maybe there’s a risk of giving TV too much credit in shaping our values and outlook and even our speech patterns (I have a theory that even though James Cook was never formally held the rank of Captain – he was Post-Captain, any of the post-Star Trek generation will by habit refer to the great explorer as Captain Cook because it sounds so similar to Captain Kirk). 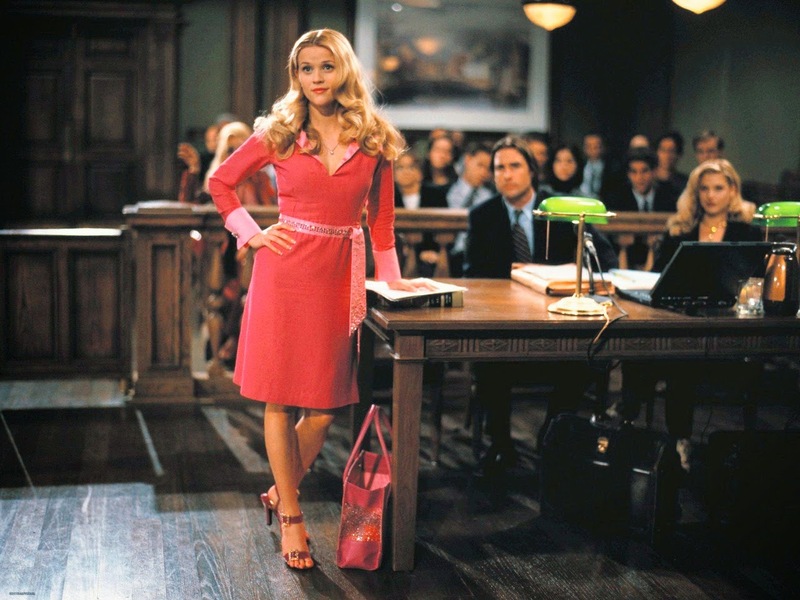 I found in my research project that amongst the current generation of female lawyer students, the 2001 legal comedy Legally Blonde was inspirational, particularly the effervescent law student Elle Woods personified by the ever-radiant Reese Witherspoon. So Finchley, you’ve just cornered yourself because Legally Blonde was a cinema movie! Of course, but I’m willing to suggest that the current crop of law students first saw Legally Blonde thanks to DVD in their lounge room. But funnily enough the transition of a successful movie to TV doesn’t always go smoothly. After the mega-success of Legally Blonde, a TV pilot of based on the movie was produced for a US network but they passed on it. Maybe there’s a hint of exaggeration in the impact of television on the minds of law students, lawyers and the general population. But really it’s no more an exaggeration that sadly some TV scriptwriters and production executives perpetuate through stereotypes we watch between our feet in our lounge room.